Through the time of the Renaissance (c1400-1550), the main center of developments in fashion was the courts in Italy and Spain. During the reign of Louis XIV in France (1643-1715), Paris became the focal point for western fashion design, and pretty much remained such until World War II (1939-1945). When Paris was cut off from the rest of the world by Nazi occupation during World War II, fashion design began to flourish in New York City (albeit with some émigré designers from Paris). To this day, Paris still has a dominant role in the fashion industry in the West, although it is now rivaled in Milan, London, and New York. The idea of a fashion designer as opposed to merely a dressmaker came about with the famous French designer Charles Worth (1826-1895). The term “couturier” which we now associate with “fashion designer” actually means “dressmaker” or “seamstress.” Worth was the first dressmaker who showed drawings of his designs to clients rather than prototypes of actual garments, as had been the age-old practice in fashion. Though little is known about Emile Pingat, during the nineteenth century (between c1850 and 1896) his fame rivaled Worth in his designs, mostly for women’s clothing. Though he designed a variety of dresses, he is best known as an authoritative designer of opera coats, jackets, and mantles. The crinoline (or hoop skirt), which is attributed as a Worth innovation and is most famously documented during the American Civil War (1860-1865) (and in films like “Gone with the Wind”), rapidly diminished in size during the late 1860s. The half-crinoline of that period gave way to the bustle of the 1870s and 1880s, exemplified in this gorgeous ensemble. The bustle consisted of a collapsible wire cage over which pads were placed. Draping, bows, and trains added to the bustle’s size. Bell sleeves were very popular during this period because they tended to offset the perceived size of the skirt. 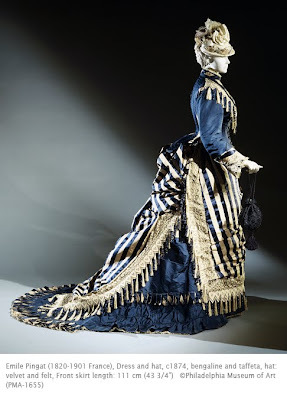 Almost all designs during the 1870s had a draped overskirt and train of some size. The striped draped overskirt of this dress resembles the so-called tablier à la blanchisseuse, or laundress’s apron, the French name for the assymetrical drape of the overskirt. Cincinnati Art Museum has a fabulous costume collection. The Metropolitan Museum of Art’s Costume Institute has over 1200 images online. You just have to wade through shoe buckles, slippers, and lace caps to see the good stuff. A must see museum for anyone interested in fashion: the Fashion Institute of Technology. See other works by Emile Pingat in Philadelphia Museum of Art’s collection. The Fashion Institute of Design and Merchandising, another fascinating school/museum that has costumes from Hollywood. The Mint Museum also has an impressive Historic Costume Collection. On a related note, the American Museum of Natural History describes the process of weaving with spider silk in Madagascar. This is a fantastic blog on the history of fashion or rather history and fashion. Very informative!